Spring is finally in the air, which means many of Moody Gardens’ 20,000 plants and trees will soon be blooming. One of the trees currently in bloom is the Sterculia foetida, also known as the Wild Almond tree. Native to East Africa, the Wild Almond’s genus is taken from Sterculius of Roman mythology, the god of manure. The name is in reference to the unpleasant aroma of the Wild Almond flowers. 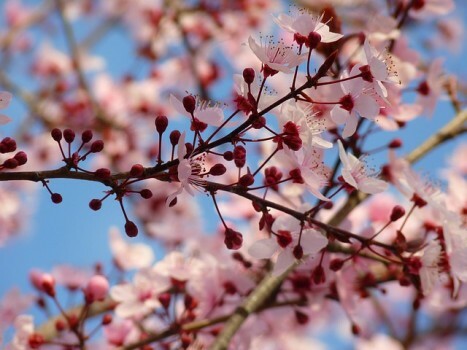 While its flower’s smell isn’t the best, the tree’s wood is so durable that it is used as masts for ships. It also produces large nuts that are dark, smooth, woody and boat shaped. The nuts burst open to reveal many filbert-sized black seeds which are roasted and eaten like chestnuts. Sound like a good ingredient for your next trail mix? Well there is a downside to these nuts. If eaten raw and in excess, it can cause nausea and vertigo. The Wild Almond’s leaves and bark have considerable medicinal value thanks to an extract called Gum karaya. The extract is used as a thickener and emulsifier in foods, as a laxative, and as a denture adhesive. The oil from its seeds is also given internally for itching and skin diseases. The Wild Almond doesn’t bloom for very long. In fact, as you can see from the photos, the Moody Gardens Wild Almond is almost done, with small, reddish flowers that are borne in clusters. It doesn’t bloom for very long, in fact, it’s about done….flowers are small, reddish & borne in clusters. And yes…they do stink. Thanks Sterculius!